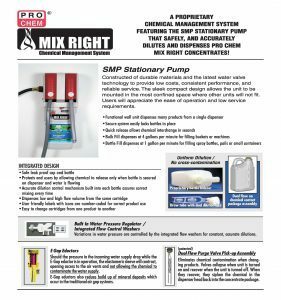 Mix Right Station | Pro Chem, Inc. The MIX RIGHT STATION Chemical Management System is a wall mounted dilution chemical dispensing system that ensures the proper mixture of chemical and water. The proprietary packaging includes draw tubes and dilution tips that have a builtin control mechanism to quickly and easily dispense the correct solution. Two output tubes can dispense either a high flow (such as buckets) or low flow (such as spray bottles) with the push of a button. 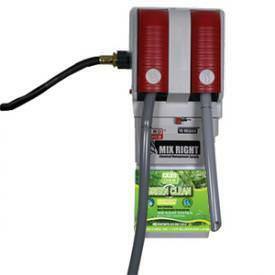 High flow dispenses at a rate of 4 gallons per minute. Low flow dispenses at a rate of one gallon per minute. The builtin dual-flow valve eliminates the possibility of chemical cross-contamination. The flow control regulators, which ensure constant, accurate dilutions, also regulate water pressure. Remove cap. With handle facing left, insert into cabinet until it locks into place. Press button to start flow of solution; release button to stop flow of solution. To lock the high flow button in the ON position: Press button until it locks into place. To unlock, press release button on left side of pump. To remove concentrate, place hand under container, slide release lever to the right and pull concentrate container out.